The St. Edward State Park Environmental Education and Research Center (EERC) will host the first of three public meetings on Wednesday, January 23 from 7:00 to 9:00 p.m. at Husky Hall, room 1160 (10909 NE 185th St, Bothell, WA 98011). This meeting is designed to introduce the EERC to neighboring communities and collect public input around planning for the new learning center. Community members are invited to be a part of planning and visioning for the St Edwards EERC. Opportunities for public comment will be available at the meeting; public comment also may be provided electronically via the SESP-EERC web site. This is the first of three meetings that will be held from January to April 2019, as the planning process unfolds. For more information, contact StEdwards@uw.edu. St. Edward is the among the most heavily used of Washington’s state parks. Its forested hills, undeveloped shoreline, streams and wetlands are home to bats, owls, woodpeckers, and other wildlife. Its trails attract walkers, trail runners and mountain bike users year-round. The former St. Edward Seminary, now listed on the National Registry of Historic Places, is currently under renovation by Daniels Real Estate, LLC, a private development firm specializing in historic preservation. The building will open as an 82-room lodge in 2020, with a portion of the complex repurposed to house the St Edward Environment and Education Research Center. Please consider writing your opinion to Washington State Parks Commissioners. 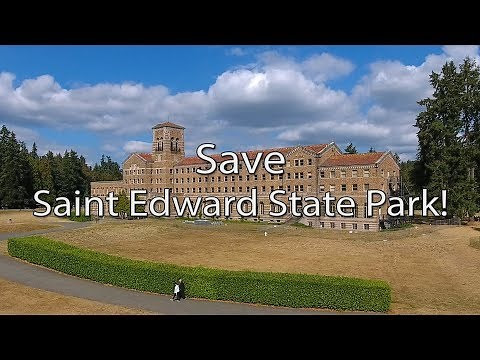 They are taking public comments regarding the City of Kenmore proposal for the conversion (destruction) of the grassy field at St. Edward State Park. Comments are due no later than 5:00 pm on Friday. Message: As a resident of (your city), I object to the drastic changes proposed by the City of Kenmore to the ballfield in this state park. It is especially important if you DO NOT LIVE IN KENMORE, that the commissioners hear from you! This is YOUR STATE PARK, not a city park.